This article was written by Chris Reid, our expert Retül Fitter at our store in Whitwell. I believe that everyone should experience cycling the way I do, for the pure freedom, euphoria and rush you get from cruising beautifully sculpted single tracks or navigating a technical rock garden where you heart is sat in your throat. Chris has a passion for bike fitting and the way it can take a rider to the next level. Chris has worked with many athletes helping them to achieve podiums at a variety of events. Have you ever wondered how people go from sitting at the back of the group ride or being the last up that technical climb to setting the pace or managing a rocky ascent? No, it’s not doping. They just decided to prepare better for the new season during the off season & they started with a bike fit. Getting their bike dialled in, adapting to the changes and benefitting from the results. Allowing them to train better through winter while on a turbo trainer or out in the cold. As bike fitters we cannot give you all the tools to be the next Peter Sagan, Anna Van Breggan, Nino Schurter or Yolanda Neff, but we are able to give the best position on your bike based on your body’s ability. This is why I have these 10 reasons why a bike fit can improve your over all cycling experience. Our winter bikes are normally very different to our summer bikes. They are our sturdy hack bikes built to withstand the brutal weather conditions and salty, gritted roads. Loaded with mudguards and lights. Spending time on these bikes in the cold, wet weather can put strain on our bodies if not fitted correctly. This can lead to injuries and ruining our summer season before it has even started. Using accurate data we dial in the perfect fit specific to you. 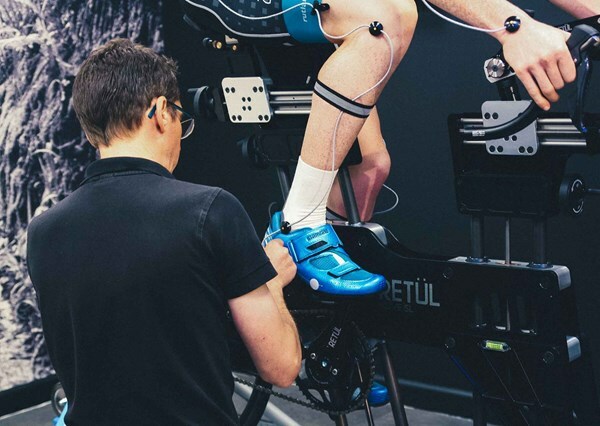 Retül have been working with Specialized since 2012 alongside Dr Andy Pruitt and his eye for every detail, developing the most advanced and data driven bike fitting system used by the leading world tour teams. Time in the saddle all depends on comfort. Being able to enjoy a 1hour ride just as comfortably as a 3hour ride is the aim. Being able to get off your bike after a Saturday or Sunday morning ride and still do a full day of activities with no issues or complaints would be prefect and its achievable. Repetitive movements can cause many issues, by assessing the fit we can fit the best biomechanically safe positions to reduce the chance of injury on the bike. Over extension or incorrect saddle size can aggravate lower back issues or create new ones. If you, like most, are desk bound during the week your neck and shoulders take a toll. Add the stress and we get tightness which leads to pain if we are hunched over for longer than 30mins. Power, Watts, Aero-dynamics are all only as good as the ability to hold the body in a certain position for an extended period of time. Better position equals better numbers for a longer period. Wouldn’t it be great if you joined the group ride on the first summer ride and instead of sitting at the back you are the one up front? Or riding around a bike park all day feeling great while others are questioning where this “New you” has come from? Ever wonder how Pro riders got their bike skills…Apart from being able to make every climb look easy or descending at impressive speeds these riders would not be able to do so if their bike fits weren’t fitted to suit their bodies perfectly. Bike handling is only as good as the rider, but the correct set up will increase said rider’s confidence leading to better control both during solo or group rides. The experience of being on a bike during a ride where everything is seamless and easy. Being able to look up and enjoy the scenery and freedom makes it all worth it. This can be on your commute to and from work or a training ride. We can learn a lot from people who have been fitted as they “Have seen the light” when it comes to an enjoyable bike ride after dreading it prior to a bike fit. Strava is here to stay. Some of us are not to fussed with who has the best time here or the best time there. However. We as cyclists have a completive streak and the Goals associated with PB’s and KOM’s. Winter training can be perfect time to aim for those goals come Spring / Summer. We cannot how ever improve on ourselves if we do not put any effort in during the off season, I too am one of those who does secret training in winter. Be it on the bike or in the gym. Longer, colder and darker… Winter is coming and it’s the start of base training leading into the 2019 season for most. What does that mean? It means its time to fit those mudguards and don the warm winter kit and get on the bike. LSD (Long Slow Distance) rides building our aerobic capacity to rider harder and longer in the warmer months. Spending longer periods of time on your bike means the fit needs to be spot on. No numbness, no niggles, no stiffness and no pins and needles. We can’t help with the cold though, sorry. As a fitter I get many people looking to set up their bikes mid-summer whereas now is the perfect time to do it. Where can I have a bike fit? To book a bike fit you can ring any of the above three stores and speak to our expert staff!